Patriotic Front (PF) Lusaka District Chairman, Goodson Banda, says his stance to add pressure to allow former Foreign Affairs Minister, Given Lubinda, to resign were not personal but the truth as backed by other senior ruling party officials, including opposition MMD Spokesperson, Dora Siliya. Mr Banda maintained that Mr. Lubinda is very treacherous against the party in government. Mr Banda says he is happy that he and other people have been vindicated on Mr Lubinda’s alleged under-hand methods. MMD Spokesperson and Petauke Member of Parliament (MP), Dora Siliya, is quoted as having said Mr Lubinda cannot be trusted. However, Mr Lubinda accused Ms Siliya of being lonely and using him to de-contaminate her image. “I’m happy that some of us have been vindicated because I am not the only person who wants Mr Lubinda out of the ruling party, PF. 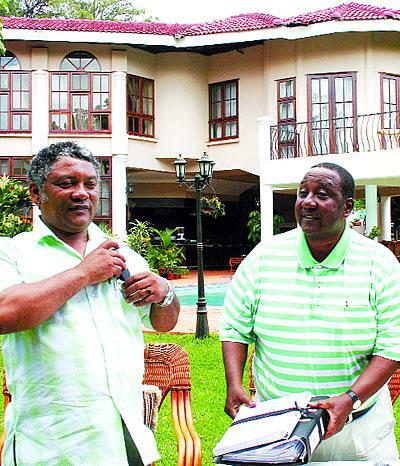 The sentiments by Ms Siliya are true in that Mr Lubinda is treacherous and cannot be trusted,’’ Mr Banda said. He further warned Mr Lubinda, who is PF Kabwata MP that his campaign mounted in Kabwata constituency ahead of a possible by election would not yield anything. Mr Banda vowed that Mr Lubinda cannot win in Kabwata Constituency, adding that the road network in the constituency leaves much to be desired as they are dilapidated. The Lusaka District PF Chairman said he is aware of Mr Lubinda who has recruited opposition youths from the UPND and ULP as well as some from the ruling PF who are engaged in campaigns in Kabwata. Mr Banda stressed that Mr Lubinda lost an opportunity when he served in government as Foreign Affairs Minister and should not be allowed to travel out of the country again to represent government because he was a traitor. Meanwhile, Mr Banda says the people in Lusaka and Zambia as a whole have realised the need to belong to the ruling party. He said the PF Lusaka District was growing because of cadres defecting to the ruling party to be part of the development agenda set by the party and Republican President, Michael Sata. “Our party is very strong not only in Lusaka district but the country as a whole. People are joining us leaving their own parties because they support the PF policies and there is nothing to offer in their opposition political parties,” Mr Banda said.